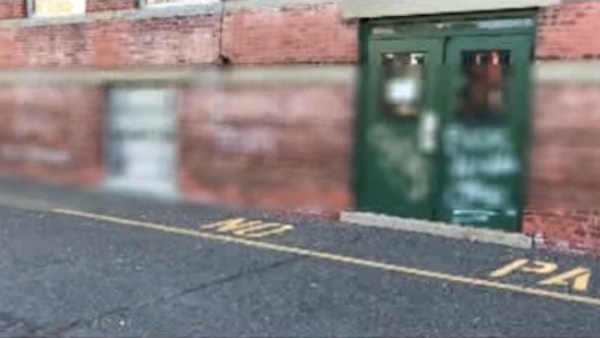 BAYONNE, New Jesey (WABC) -- Police have arrested a 20-year-old Bayonne man on charges of vandalism directed at a local mosque. On Friday morning, police discovered numerous acts of graffiti, written with spray paint on the exterior walls of the old St. Henry's Elementary School on Avenue C.
A majority of these were located on the 27th Street side of the building where the entrance to the Bayonne Muslim Center is located, authorities said. The graffiti consisted mainly of denigrating comments towards the members of the Muslim community who attend services there, according to investigators. Police say detectives, based on an eyewitness statement and camera footage from area buildings, were able to identify the suspect, Jonathon Hussey of Bayonne. He was charged with Criminal Mischief, Bias Intimidation, and Criminal Trespass. The mosque is a temporary location that is being used for prayer services. There is a proposal for an Islamic Community Center that is awaiting city approval. Opponents say it's a zoning issue. There is no date set for the next zoning board meeting.